Team Liquid has released a new update to their 6.20 Pro LCFW, 6.20 Pro-B6 with new features and several bugfixes (specifically with regards to Dissidia Duodecim and it’s DLC). A PSP with 6.20 OFW installed. 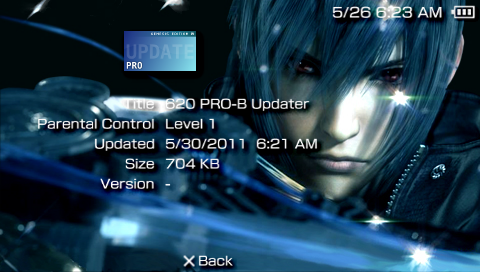 If you’re not on 6.20 OFW and want to install 6.20 Pro-B6, follow this guide: HowTo: Upgrade your PSP to 6.20 OFW. Important Update: PRO-B6 was updated with a tiny patch concerning the NODRM engine. If you have installed 6.20 Pro-B6, please download the installer again and update. Important: Install the permanent patch AFTER you install 6.20 Pro-B6. To install, just place the folders from the zip file into PSP/GAME and run 6.20 PROUPDATE from your XMB. Use the FastRecovery to reload 6.20 Pro-B6 LCFW without doing the reinstall process again. Be sure to have 6.20 Pro-B6 installed. so, my OFW is 5.50? should i use the 6.20 pro-B6? Are you sure it’s a PSP-3000? 5.50 Prome-4 can’t be installed on a PSP-3000 because it’s a permanent firmware. I’ve got 6.20 Pro-B6 now but this is my first ever hack on psp. How would i go about getting something like MHP3rd on here now? Just copy the ISO file into an ISO folder on your PSP’s memory stick. I have psp 3006 5.03 gen-c (full), Brite 03g, model TA-090 v2…. I just wanna ask if i could install 6.20 pro-b 6? .. If there is a chance to upgrade from 5.03 to 6.20 firmware? Yep you can upgrade to 6.20 Pro-B6. Just remember to unload 5.03 GEN-C (turn off your PSP). Check if your PSP is running 6.20 Pro-B6 and not just 6.20.
yes ma’am my psp running 6.2 pro B6. Should I downgrade it to 6.2 only before putting a CF to fix this issue? Or the custom firmware only will fix my problem? tnx..
well sylv3rblade, do you mean that by install the permanent patch we can play the ISO(s) games without doing the reinstall process again? With PRO you really don’t need to reinstall. If it gets unloaded for any reason, just run the Recovery. sorry I’m still confused a little bit, so why do we have to install the permanent patch? is that really necessary? and I wanna ask whether is it okay or not if I forgot to use the recovery to load the CFW (after the first installation using the PRO update) and use the Pro update again a.k.a reinstall process instead ? will my PSP goes to be wrong? hi sylv3rblade, i’m using 6.20 PRO-B6 on my psp fat, i got my psp when it first came out. is there a higher version of firmware that i can install on my psp? i have psp 2006 TA-088v3 OFW 6.20..
6.20 PRO-B6 work on my psp? wat version should i update?